Another bracelet in my 'Dagger Flowers' series which uses two types of peyote stitch and two types of beads to form flower jewellery. You can see the original bracelet here and a ring in the same series here. 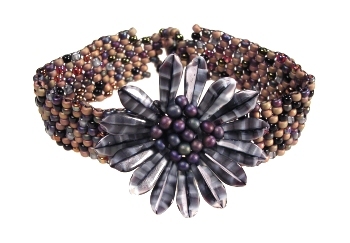 This bracelet and projects based on the series appear in the April 2006 issue of Bead and Button Magazine under the title 'Playful Petals'.